YoYoExpert Blog & Yo-Yo News – Happy National Yo-Yo Day! June 6th is National YoYo Day, celebrated in honor of the birthday of Donald F. Duncan Sr., the founder of Duncan YoYos. And that’s right! 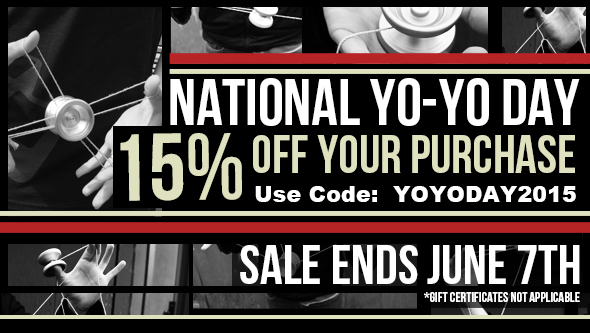 15% off your total purchase at YoYoExpert.com for National YoYo Day! Use coupon code “YOYODAY2015″ at checkout to receive your discount. Friday and Saturday only! Promotion ends June 7th!